Nissan announced today that an all-new 2013 Sentra Sedan will be coming to the North American market later this year. Nissan unveiled an all-new global sedan today at the 2012 Beijing Auto Show and has announced that this new model will be the basis for an all-new 2013 Nissan Sentra here in North America. Nissan has also given us a teaser video and images to go along with the announcement. The images come from the 2013 Sentra SR, that will be uniquely styled for U.S. buyers. Nissan says the all-new Sentra will be officially unveiled later this summer and will be in North American dealerships this fall. Nissan is launching the 2013 Nissan Sentra in conjunction with the nameplate celebrating its 30th anniversary in the U.S. The Japanese car company promises to bring a new level of refinement and innovation to the segment. Nissan is planning a big 30th birthday bash here the U.S. and the 2013 Sentra will be the third of five all-new models that the Japanese company will be introducing over the next 15 month’s. The brand will be updating a major portion of their product line as they launch the new models with the intention of increasing their market share here in the U.S.
"Sentra is the third of five all-new core models we'll be introducing in a 15-month product onslaught," said Brian Carolin, senior vice president, Sales and Marketing, NNA. "The all-new Altima goes on sale this summer and will be followed closely by the all-new Pathfinder and Sentra. And when the next two new models launch in 2013, we will have refreshed 75 percent of our volume, rewarding our loyal owners and attracting new customers into Nissan showrooms." The current 2012 Sentra is a four-door sedan designed for the American market and American buyers. The compact sedan offers a commendable level of features, sophistication, safety and technology. It's powered by a 2.0-liter four-cylinder producing 140 horsepower, which is mated to a six-speed manual in the base model, while a continuously variable transmission (CVT) comes standard in upper trim levels. Two high-performance versions are currently available: the 2012 Sentra SE-R has a 2.5-liter engine with 177 hp and the CVT. The SE-R Spec V has a turbocharged version of the 2.5-liter engine jumping to 200 hp and fitted with a six-speed manual. Sentra SE-R models also feature suspension modifications for sporty handling. 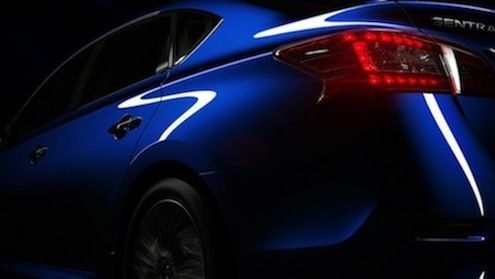 Watch the 2013 Nissan Sentra teaser video below. I was thinking the same thing. Unless things have changed, the only US car I'm aware of that's in Nissan's lineup that uses a turbo would be the Juke.